We take pride in filling quickly and accurately. We take extreme care while filling prescriptions and we assure you accuracy you deserve. Our usual wait times are 10 minutes or less. We give utmost importance to client’s time and fill prescriptions accurately and efficiently in 10 minutes or less when customers walk in to our store. 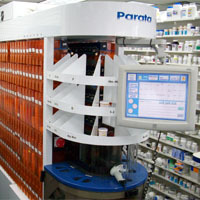 Along with our highly trained Staff who double check the prescriptions we count on 100% accurately filling state of the art Robot system to fill prescriptions at our place. The prescription filling system we have in place brings the chances of making errors at our Pharmacy close to zero.